This morning I wanted to be in the living room, watching a few of my favorite shows in front of the fire (yes the fire!) with my feet up. 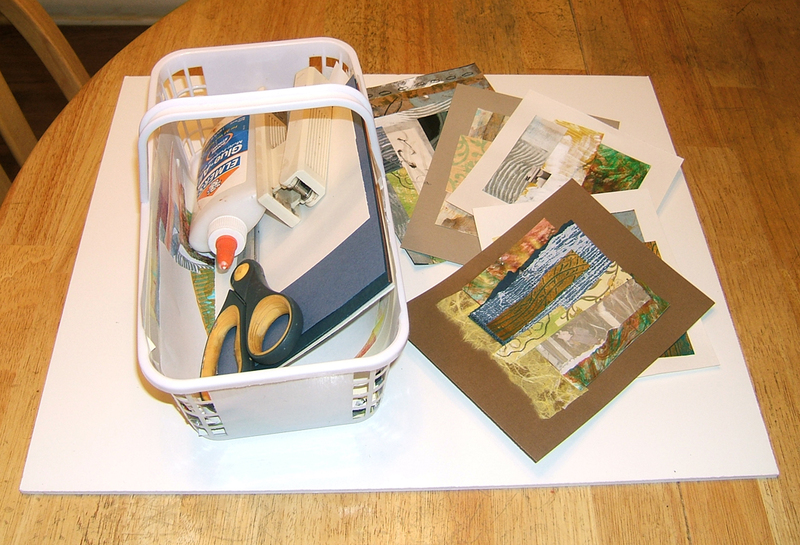 But I felt guilty not working on my art, so I put together this nifty little lap-sized collage kit. It consists of an 18×24- inch piece of foam core I had lying around, for my lap, and a little basket that we brought peaches home in, containing a variety of papers, some glue, scissors, and a stapler. Many of the monotypes I’ve been making have wound up in pieces in this basket. Delightful additions to the mix of papers for collage! While I sat there I was able to make five new collages. I’ll show you the individual ones in future posts. This one was made using elements from a couple of the recent monotypes . . . I think the collage is even more fun. Beautiful work! I love both of these. Thanks, Ashley. So glad to know you like them. Lovely work! I love how neat it is………..I am sure it didn’t look that way by the time you were done! HA! I just got my gel print today and am looking forward to using it asap. How exciting, Roberta! You’re going to have fun!! You are always inspiring us Martha. These have turned out Great! I have a small old puzzle board for my lap as a support. We all like to be cozy & curled up sometimes. 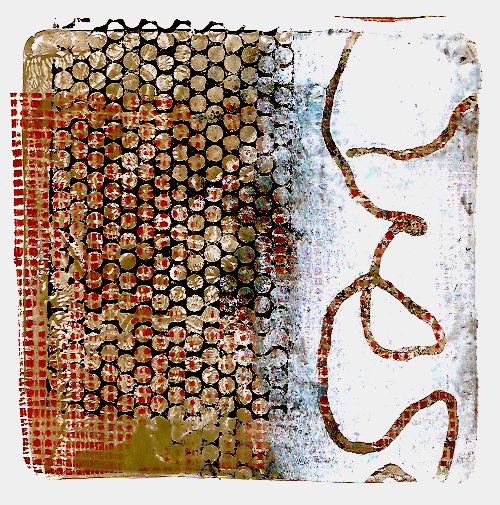 What are you using for your collages as a substrate? Bristol, watercolor paper 140 lb?? Thanks, Pat. I use whatever good paper I can find lying around for a substrate. I always have trimmings of heavy paper left over from larger works, so I just set them aside for collage projects. But in addition, I buy and keep on hand pads of Bristol and cold press watercolor paper (typically 100 lb.) and I even use 70-lb. acid free drawing paper. Sometimes I create a collage on a pre-cut backing that is cut to size, then mount it on a larger backing later, but what I really like doing is making the collage directly on a larger sheet and just letting it kind of spill out into the border. 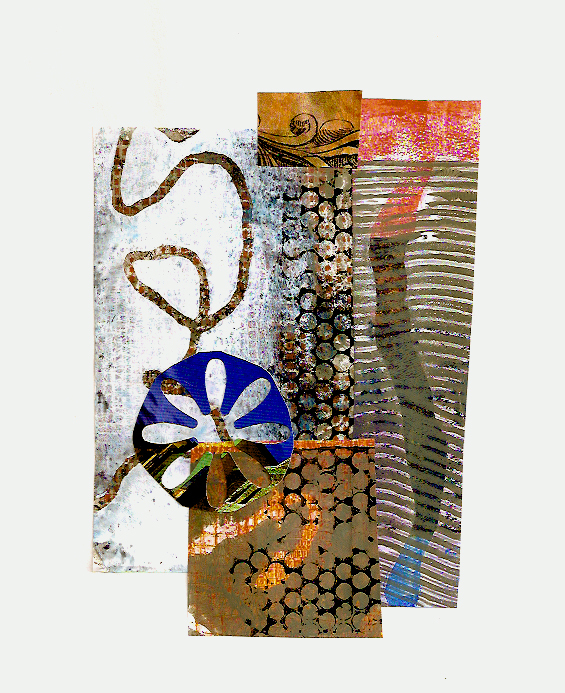 The collages using the monotype papers are great! Nicole, for me it just seems to open up huge possibilities. Glad you like them. Glad now that I did it, Jenny. I’m sure I’ll be using this little kit a lot. And yes, “what to put in?? ?” Although limiting the choices can sometimes focus the mind.